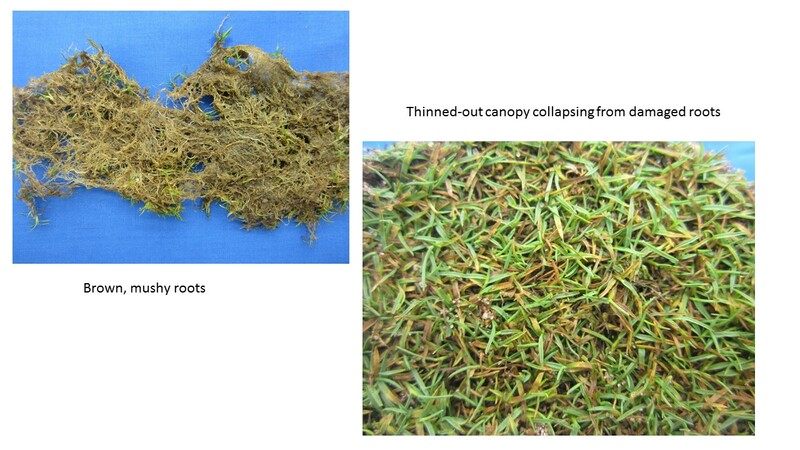 We had a sample come in with soggy roots, algae, and a lot of thinning. Here is the root zone. Lots of organic matter holds water, which holds heat. Hot, wet roots can decline quickly. Hot, soggy roots can’t support growth. Looking closely, there was algae present. 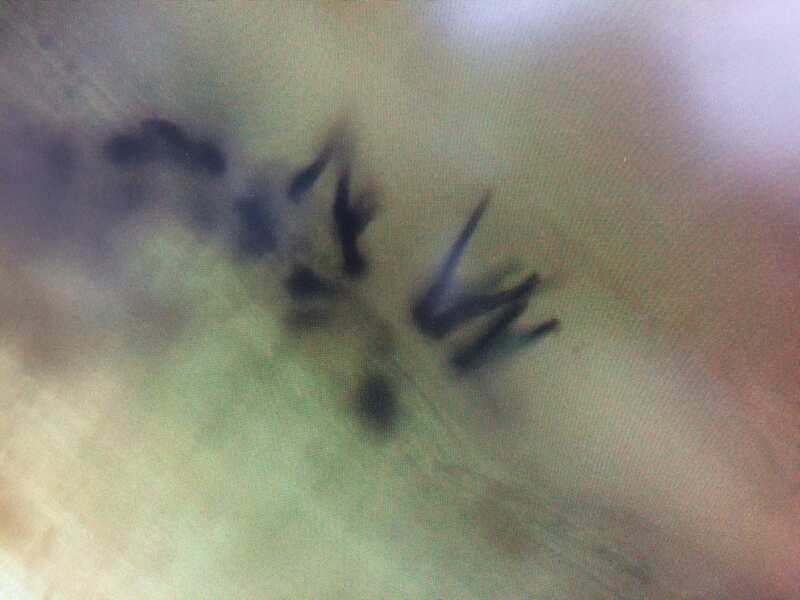 The dark green stringy stuff in the circled area is algae growing on the turf, viewed in the dissecting microscope. 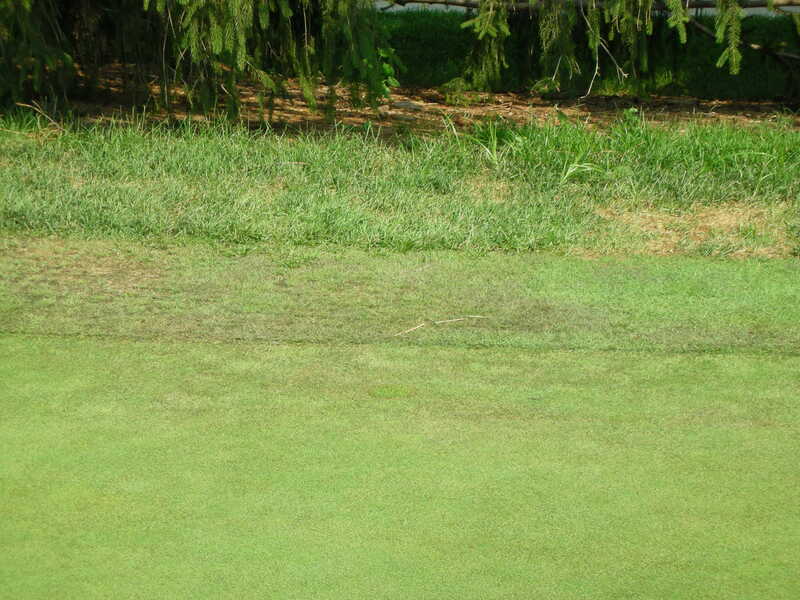 Algae is another indicator of wet conditions. 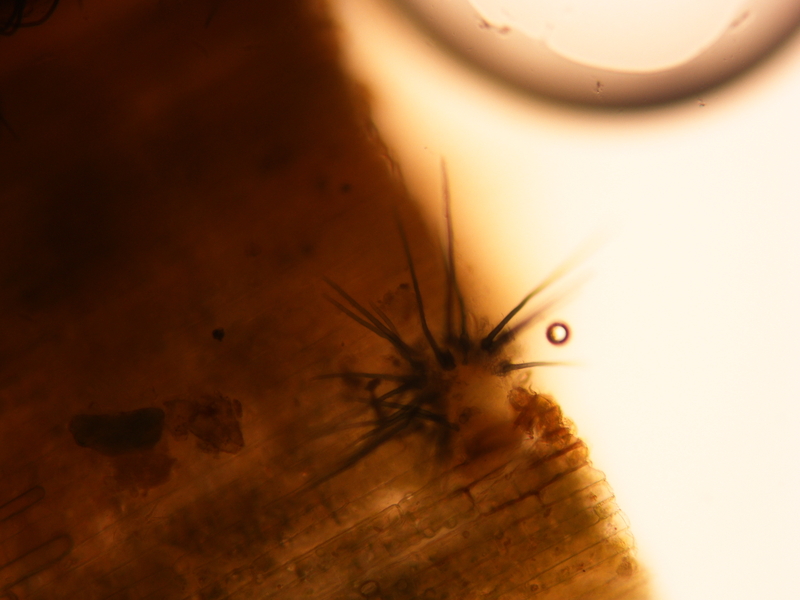 At closer inspection, in the compound microscope, spiny black structures were visible near the base of many declining plants that were just starting to fade from green to yellow or tan. These structures are called setae, from the anthracnose pathogen, which is a fungus. 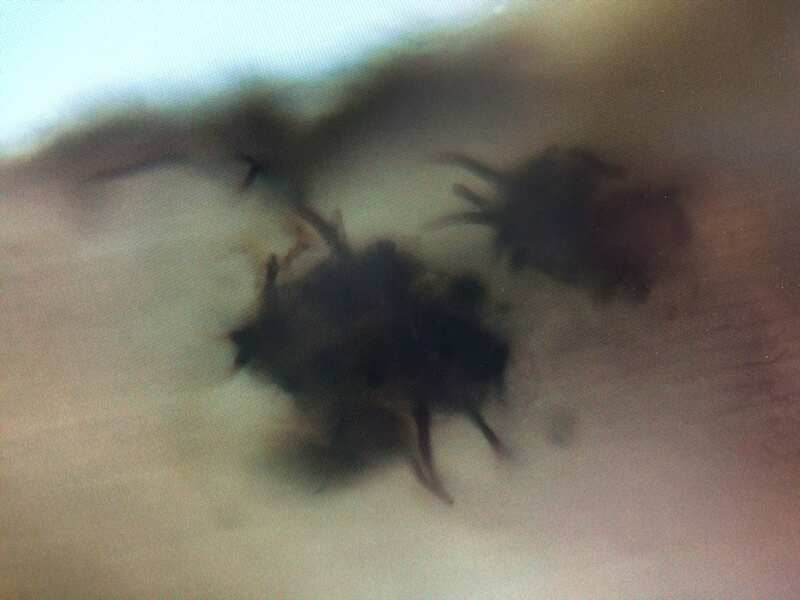 The anthracnose section starts on page 8. As you glance through, you may notice that many of the practices to reduce anthracnose are similar to practices to reduce overall summertime stress in putting greens, such as providing enough but not too much water, raising mowing height (even a tiny bit can make a difference), skipping mowing and rolling instead, and maintaining adequate N. You can find the whole list starting on page 6 of Chemical Control of Turfgrass Diseases which, in short, includes information about mowing height, watering, fertility, foot traffic, dew, phytoxicity warnings, and more. We highlighted those a few weeks back in another post. 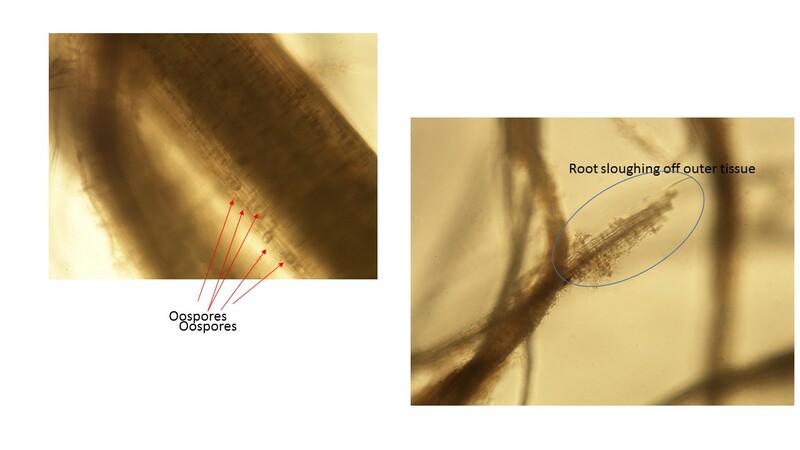 We recently received a sample with anthracnose crown rot. 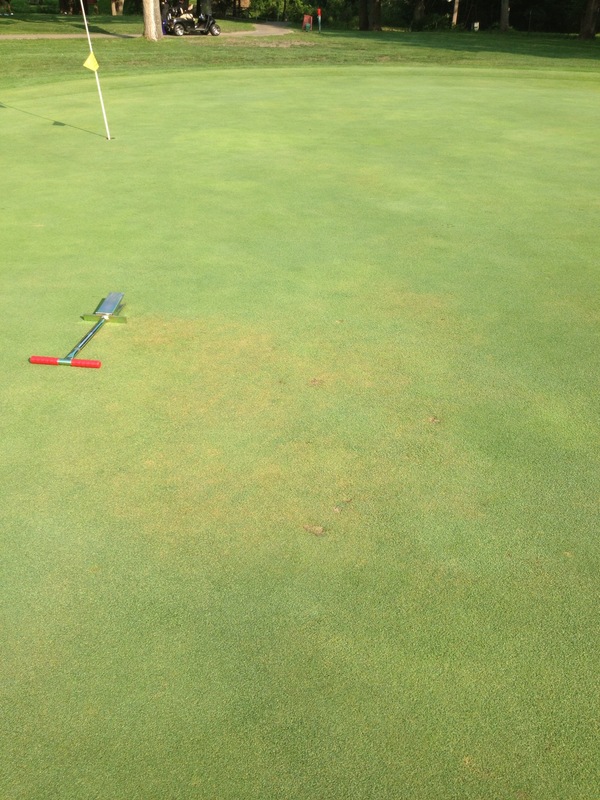 Anthracnose can be tricky to diagnose from a distance or a drive-by. The symptoms can look like other diseases or stresses such as physiological root decline. 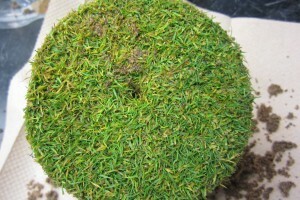 Another tricky thing is that those same stresses can make the turf more prone to anthracnose. Yikes! 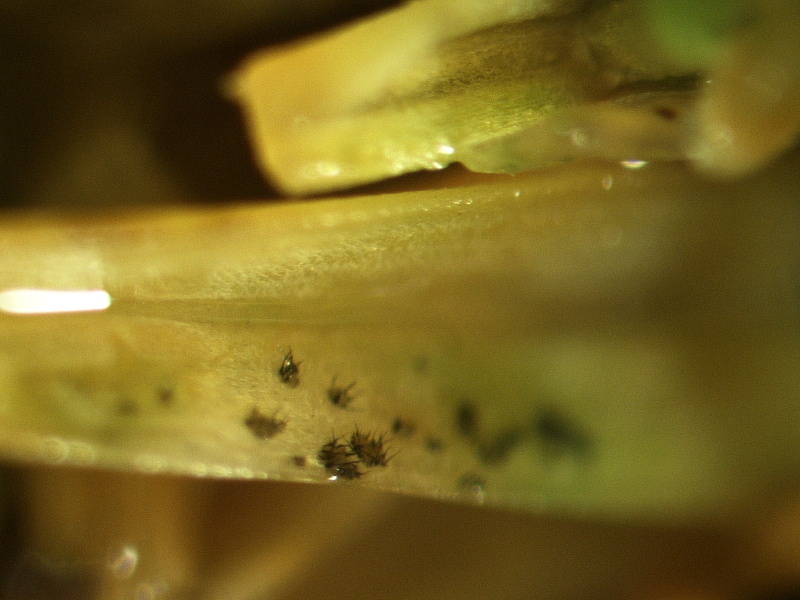 It’s worth investing in a high-quality hand-lens, and with a good hand lens and a steady-hand you can often see the anthracnose structures lurking down at the base of plants. Sending to the lab as a follow-up is another good step, since we can look for other pathogens that might be lurking in the roots. The photo below is through a dissecting microscope, but those same dark spines can often be seen with a hand lens. Look for structures on green tissue, not brown/dry tissue. Anthracnose is pretty good at colonizing stuff that is already dead, as an opportunist. When we see it on juicy green tissue that is when the disease is active. Here are a few quick pics from the diagnostic lab. These photos were taken by our summer intern, Beth McKinzie. 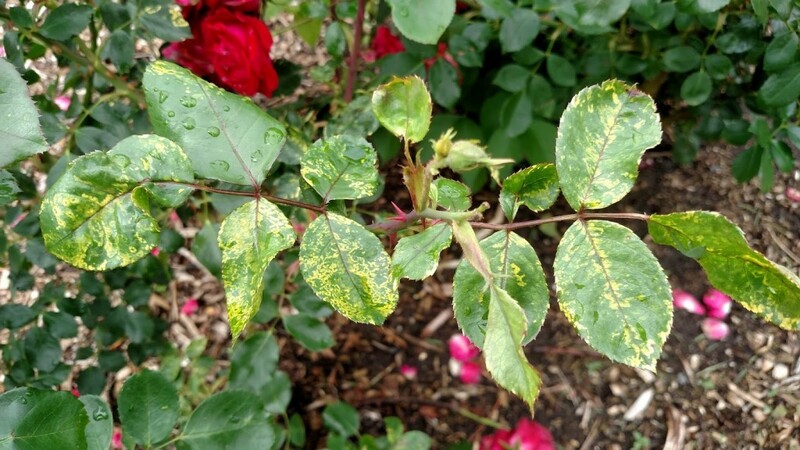 Rose mosaic virus is caused by several viruses, sometimes in combination. There is no control for this disease once the plant is infected. 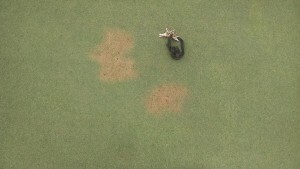 Diseased plants are not killed outright but may have reduced vigor and are more prone to winterkill. Symptoms are most prominent on new growth in spring. The virus is spread by propagation practices. Remove and destroy affected plants. Anthracnose diseases affect several tree species in Kansas. Anthracnose causes brown irregular leaf spots, often along veins. 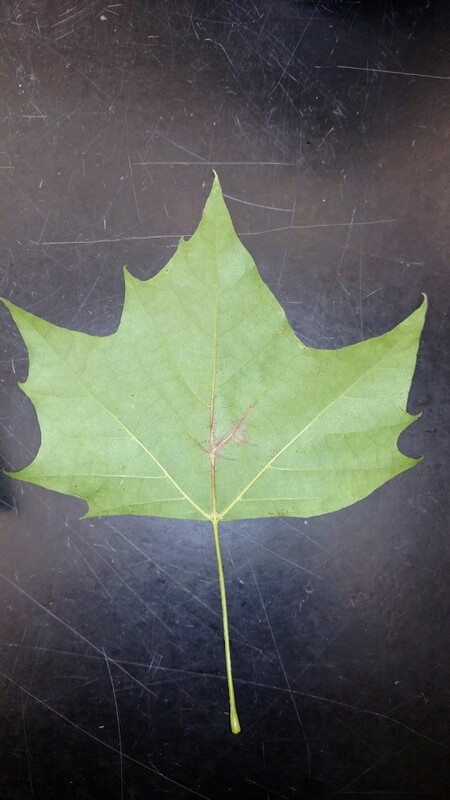 Premature leaf shedding and twig blighting can also occur. Symptoms develop during wet spring weather. 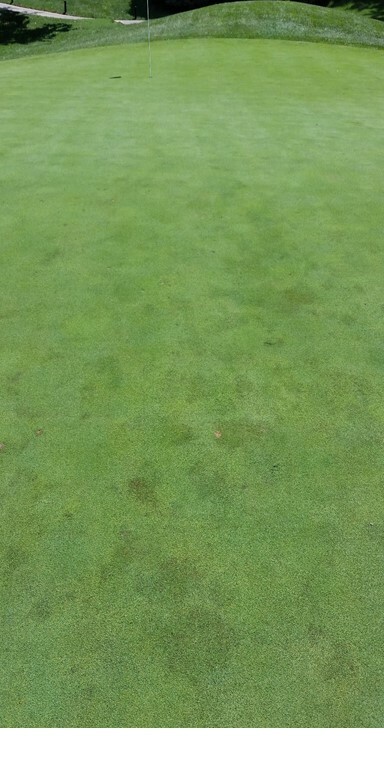 Anthracnose is rarely damaging and primarily cosmetic, with no management needed. Trees usually produce new foliage and recover with the onset of warmer, drier summer weather. For more on anthracnose in shade trees, you can read more HERE. Wetwood is caused by multiple species of bacteria that reside inside the tree. It is common in elm, cottonwood, maple, mulberry, oak, willow, and sycamore. 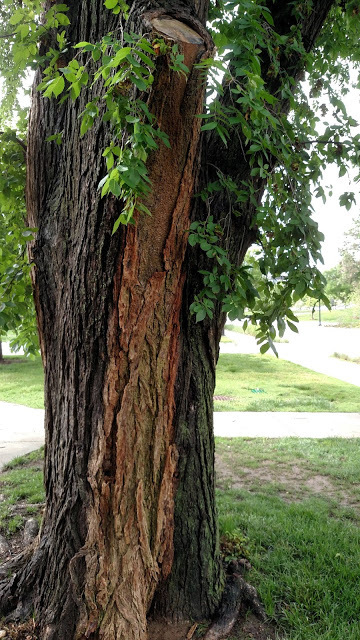 Liquid oozes from wounds and cracks and runs down the bark, leaving discolored streaks on branches or trunks. This is primarily cosmetic and no management is needed. The temperature dial is getting turned up, and summer stress is on the way. Unfortunately summer is often when we are sometimes pushing greens even further with low mowing heights for tournaments, etc. 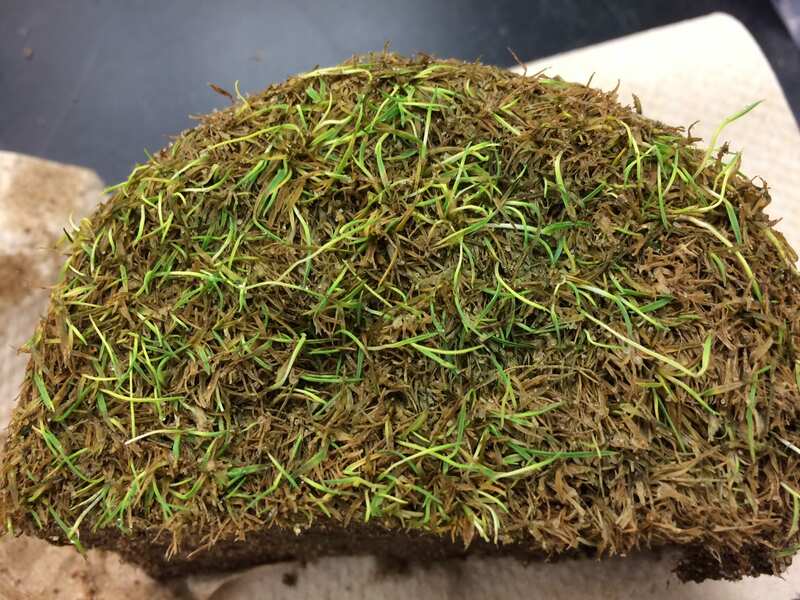 Over the past few years, Rutgers University has led a multi-university research program to investigate the impact of cultural practices and fungicides on turfgrass anthracnose, including fertility (it’s really important! ), mowing height (even a small increase can help! ), and more. 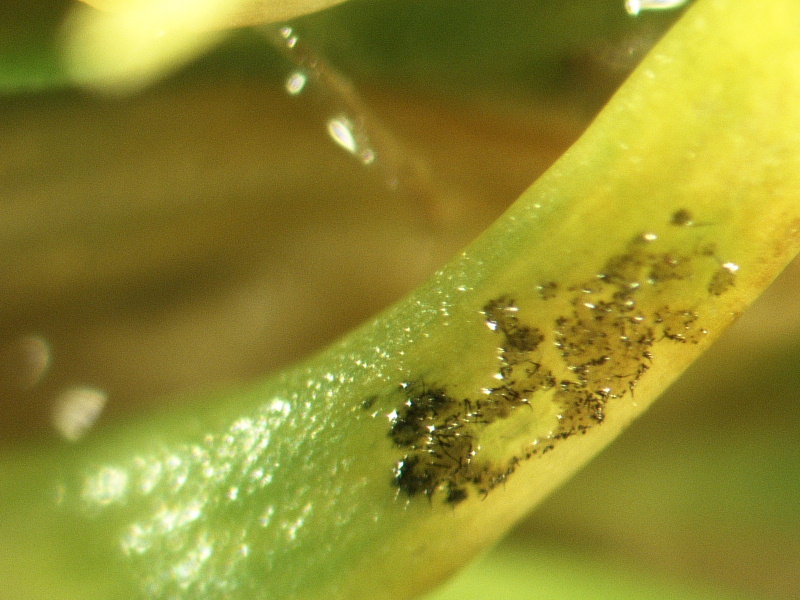 We have some more information about anthracnose (including fungicide info) HERE. The BMP’s from Rutgers are outlined HERE. 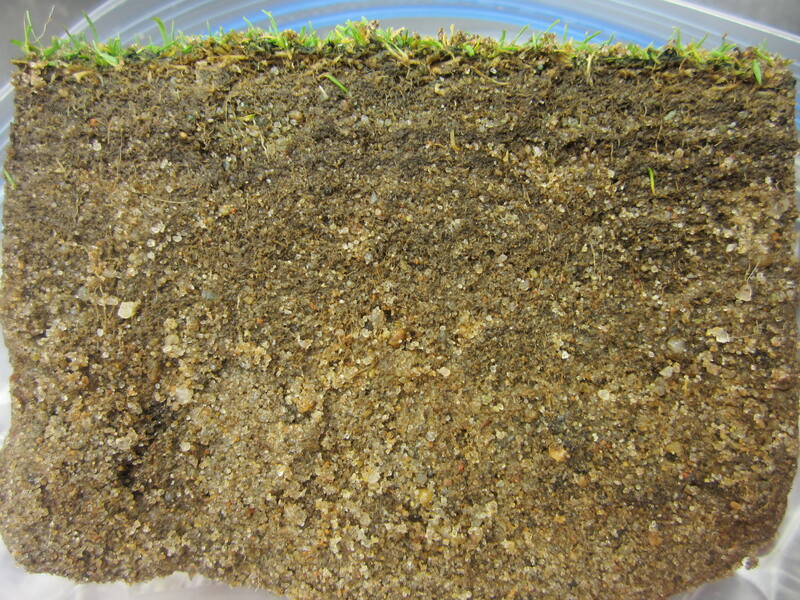 Fertility program: Provide adequate nitrogen to maintain turfgrass growth. 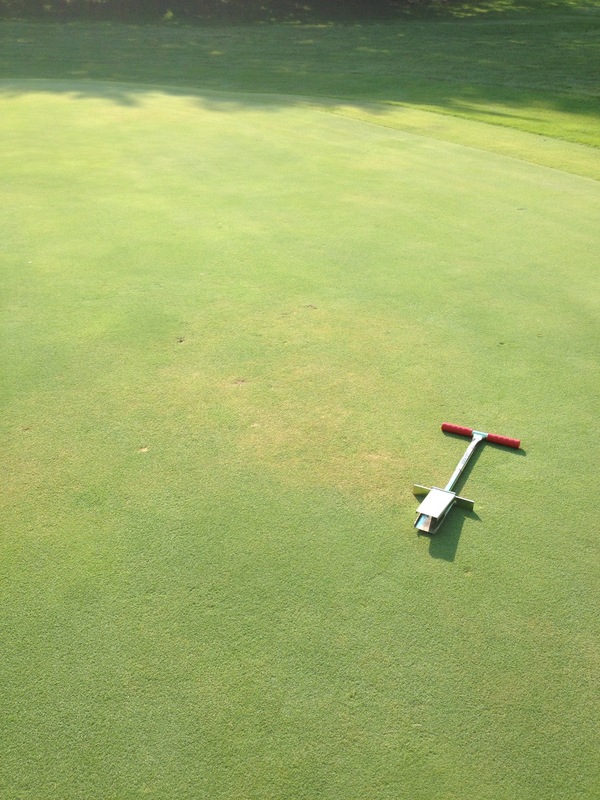 Low nitrogen can increase anthracnose severity. Applications of soluble N at 0.20 to 0.25 lb N/1000 square feet every two weeks is beneficial. Apply adequate potassium. 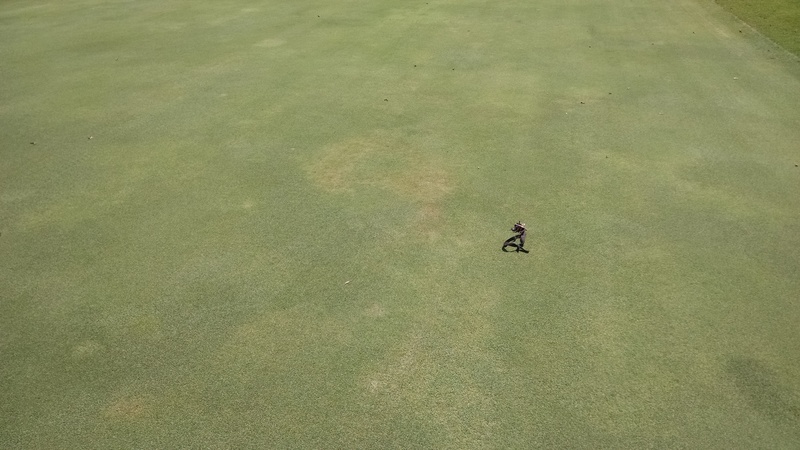 Mowing and rolling: Low mowing heights can raise the risk of anthracnose development. Slight increases in mowing height can reduce disease pressure. Consider raising the mowing height to 3.6 mm (0.14 inches). Rolling on alternate days will increase ball roll and can slightly reduce anthracnose severity. Irrigation and drainage: Anthracnose can be more severe with either too much or too little water. Irrigate to supply 60-80% of evapotranspiration. Avoid wilt stress. Hand-water when practical. Anthracnose tends to be more severe on putting greens with poor air movement and poor drainage. 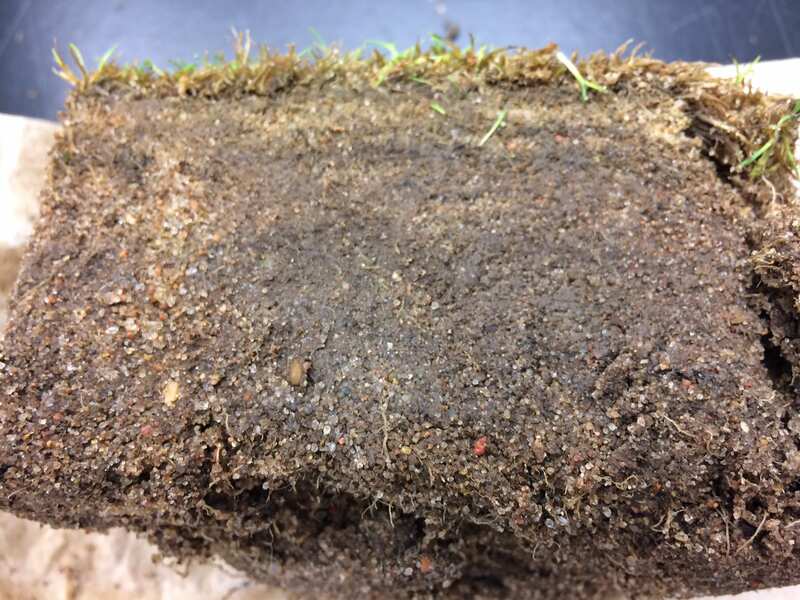 Don’t overwater putting greens: excessive soil moisture may damage roots and decrease photosynthesis, predisposing it to anthracnose injury. Aerify in the fall to improve drainage, and improve airflow to the site. 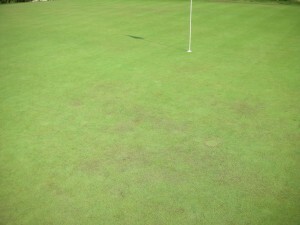 Topdressing: Light, frequent topdressing reduces the overall risk of anthracnose. Foot traffic: In one of the more recent Rutgers studies (link to article HERE by Joseph Roberts and James Murphy), they looked at foot traffic + sand topdressing, foot traffic – sand topdressing, no foot traffic + sand topdressing, and no foot traffic and no sand topdressing. 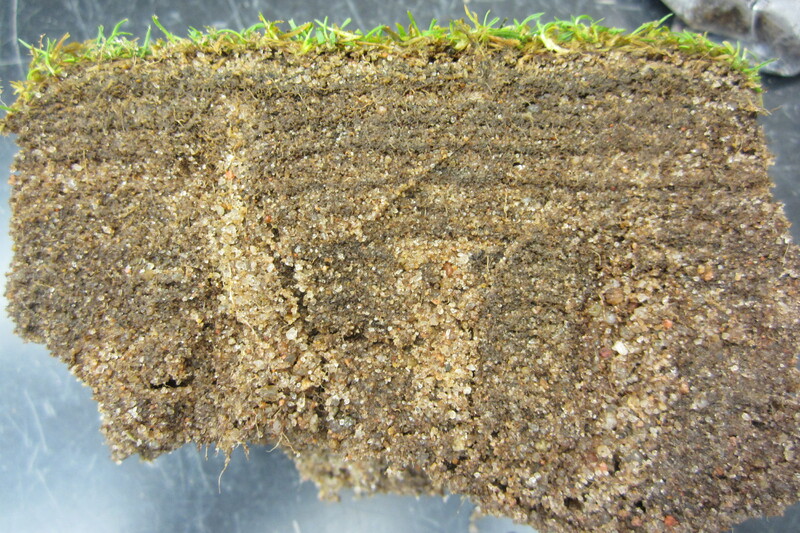 The combination of foot traffic + sand topdressing had the LEAST amount of disease. 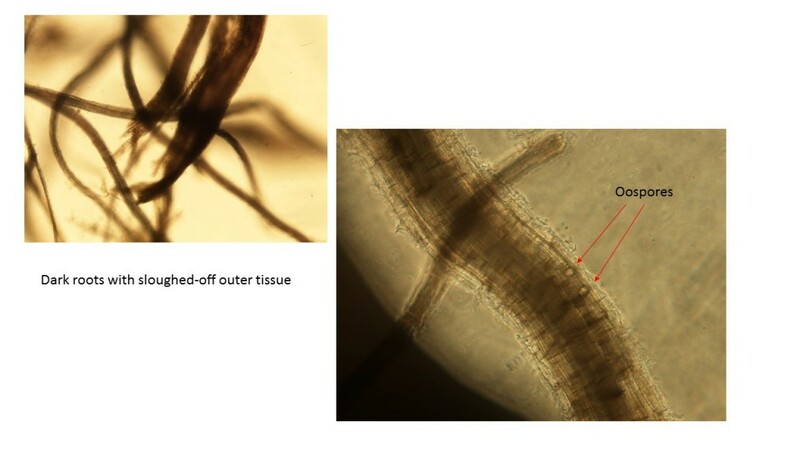 Plant Growth Regulators: Normal use of trinexapac ethyl and ethephon has reduced anthracnose in trials. Mefluidide has had little effect in most cases. Cultivation: Shallow verticutting (0.13 inch) has had mixed results, leading to slight increases in disease in some studies and no effect in others. If anthracnose is active, use fungicides before any cultivation. 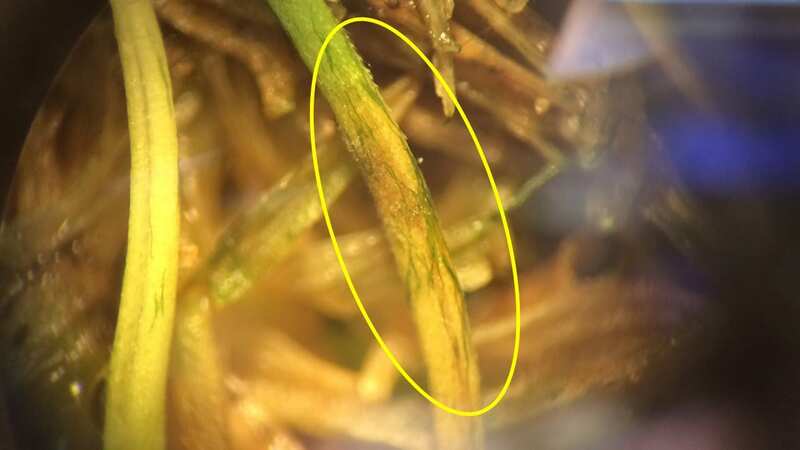 I just heard from a superintendent in South Central KS who is experiencing some anthracnose, and Dr. Lee Miller recently reported anthracnose activity in Missouri as well. 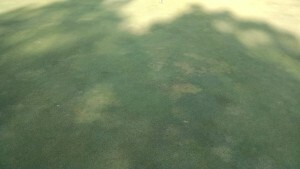 We commonly see anthracnose during summer stress but it can definitely occur all season long. 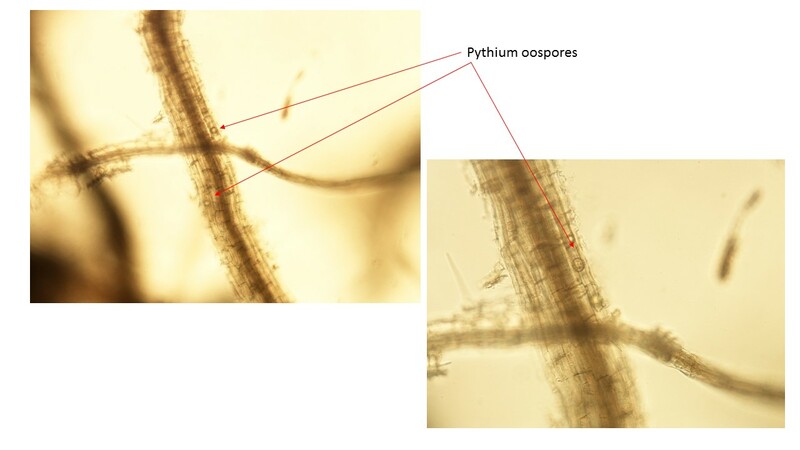 We have some more information about anthracnose HERE. Here is a sight that no superintendent wants to find on their course.These photos are from July/August of recent years. What is this problem? 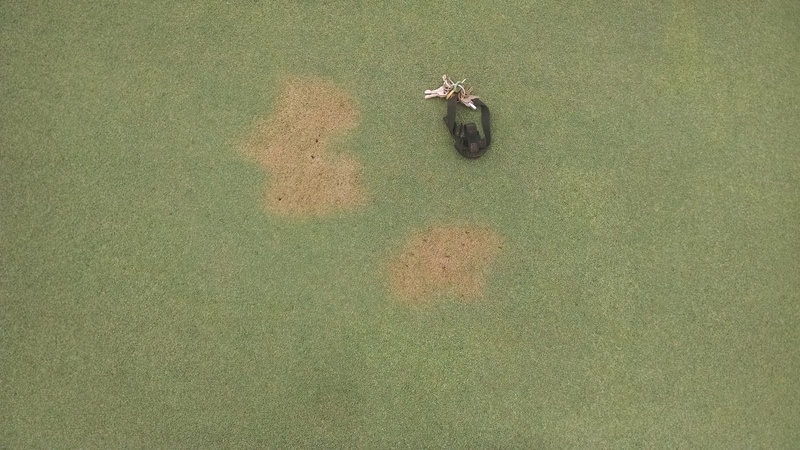 It’s hard to tell just based on photos, but after follow-up testing in the lab, we determined this is anthracnose, an important fungal disease in putting greens. 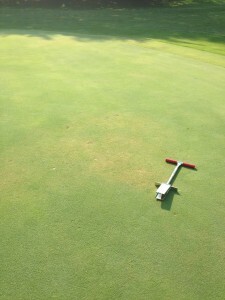 How does nitrogen (timing and amount) affect anthracnose? 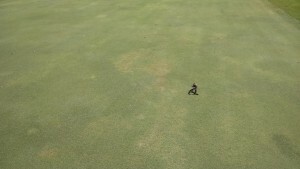 Does rolling increase anthracnose? What about foot traffic? 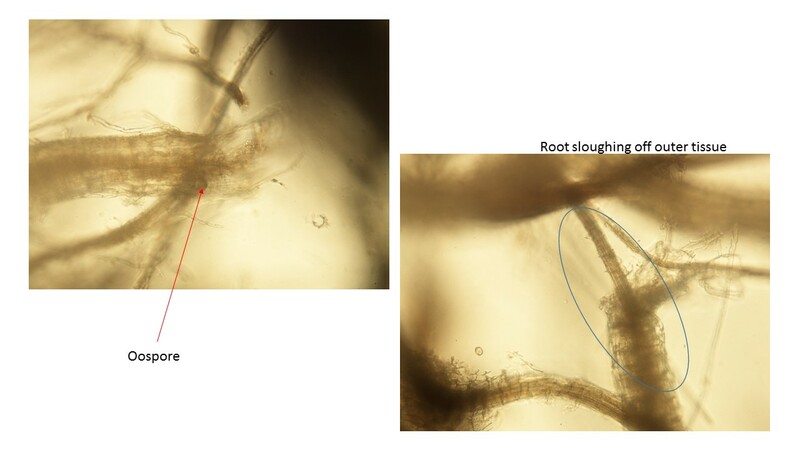 How does irrigation impact anthracnose – should I run the turf wet or dry to prevent it? 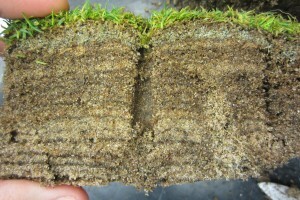 Over the past few years, a team of turfgrass researchers has been conducting experiments to answer these questions. 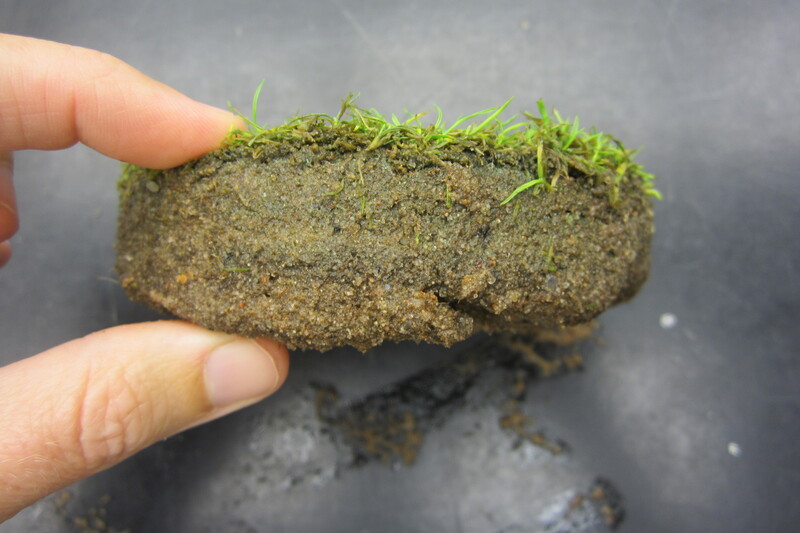 The have developed a science-based list of best management practices (BMPs) for turfgrass anthracnose. 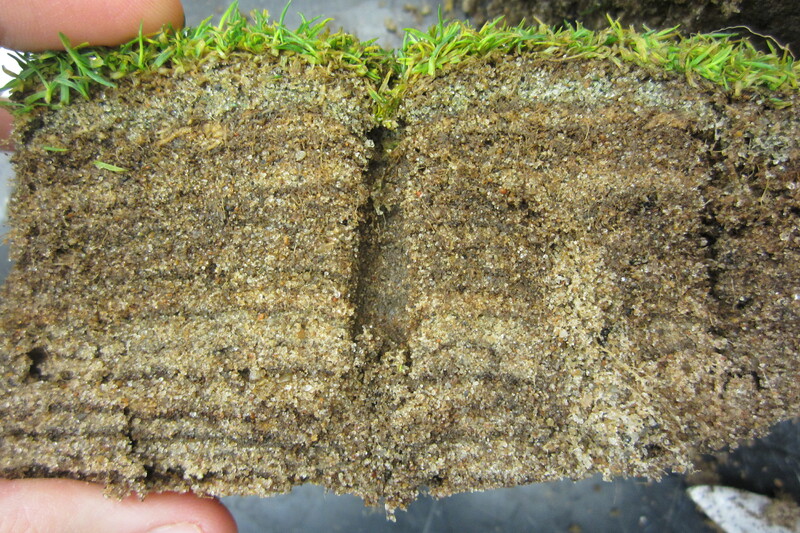 Various researchers studied the effects of nitrogen, potassium, mowing, rolling, plant growth regulators (PGRs), irrigation, topdressing, aerification, foot traffic, and fungicides. Based on that work, they developed a set of recommendations. Rather than copy all the text into this page, I’ll provide the link below to their BMPs (it’s 2.5 pages – detailed, but concise and easy to understand), then add a few comments and photos. Here in Kansas, the samples of anthracnose that I have seen were usually associated with the “risk factors” identified in the BMP list – low mowing, keeping N low to keep things “lean and mean” before a tournament, poor drainage at the site, etc. 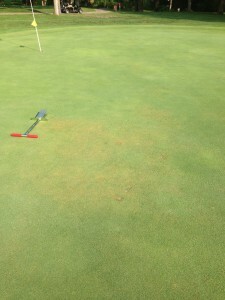 Okay – anthracnose is more likely during summer stress. Why am I talking about this NOW? It’s important to keep the BMPs in mind all season long, not just when you are already into a stressful time of year. 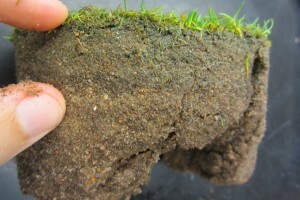 Managing the turf holistically, all-season long, will help reduce your risk of this disease. As you’ll see in the BMP’s, it’s mostly a set of good agronomic practices, too. There’s nothing on that list that is out-of-bounds with routine good agronomy. And, you don’t necessarily have to do EVERYTHING on the list but I’m sure you will find some practices that fit with you and your site and budget.